Don't disturb a urinating cat, it might keep him from using the box again. House soiling is one of the less desirable perks of pet ownership. You may be annoyed at your cat for missing the litter box, but there's a good chance that he's not entirely to blame. Luckily, there are a few things you can do to contain your cat's bad habit. Some cats are natural sharpshooters when they use the bathroom, others aren't quite as precise. Your cat just may not care if he misses. A big cat and a small litter box don't mix. If your pet tends to pee off the side of the box, a larger tub or one with tall sides may be the easiest way to stop him from soiling the carpet and walls. 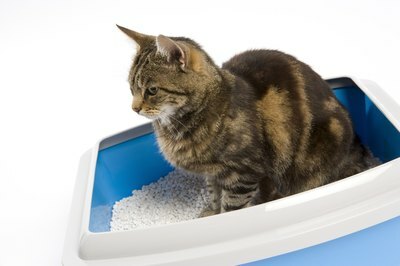 These methods help only if your cat is getting in the litter box, but urinating outside of it. If he avoid the box altogether when he relieves himself, then accuracy probably is not the problem. Urinary tract infections, kidney stones and other health issues make it hard for your cat to pee, so he may avoid the litter box because he associates it with pain, according to Standford Cat Network. Kidney, thyroid and other organ problems make your cat thirsty, which increases the chances of him going potty outside the box. Your cat might not be able to control himself when he soils the house. Some conditions prevent your cat from holding urine in, so he might not make it to the box in time when he has to go. Schedule an appointment with your vet if your cat starts urinating outside the box to make sure he's in good health. Your cat's new house soiling habit could be your fault. It's easy to procrastinate cleaning the litter, but it can get pretty messy if you do. Some cats aren't too picky about how clean their litter is, but many refuse to use it when it gets too dirty. They may stand on the edge of the box, or avoid it altogether, so they don't get dirty. Either way you'll end up with urine outside the box. Scoop your kitty's litter every day, especially if you have multiple cats. Change it out once or twice a week as needed. Your cat may relieve himself outside the litter box walls if he doesn't like the litter, box or location, according to Cornell University College of Veterinary Medicine. Put the box in a quiet area away from foot traffic. After all, nobody wants to be disturbed when they are using the bathroom. If you recently changed boxes or litter brand, try putting out the old equipment to see if it helps your cat's behavior. A change in the texture or smell of the litter might confuse or repel your cat, so watch how he reacts to new types of litter.